after school spanish language program! Our after school program for kids takes a highly engaging multimedia approach to enhancing your child's Spanish language skills. Through exposure to music, art, and movement this program guides children through a journey into the great mosaic of cultures that are collectively known as “Latin America”. By using their senses in a wide array of both manual and perceptual activities, children will enhance their vocabulary, experience language usage in a practical setting, identify geographic features, rhythms, languages, food, ecosystems and traditions indigenous to each region! 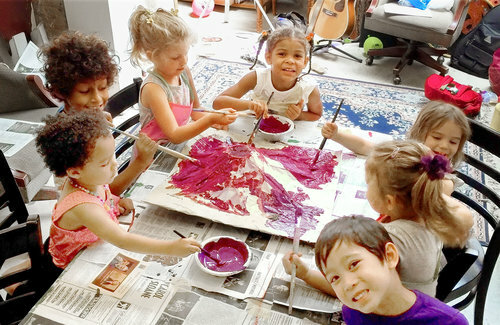 El Taller’s expert team of teachers are also professional artists and musicians who fuse El Taller’s 4-decade-strong language method with a unique creative curriculum sure to excite and enrich all children. Crafting volcano models based on Latin America's several volcanic provinces. Mask making informed by the carnaval aesthetics of Bolivia, Puerto Rico and Colombia. Painting inspired by the style of Buenos Aires' Xul Solar, Mexico's Frida Khalo, Brazil's Tarsila do Amaral, and Venezuelas Jesus Rafael Soto. Singing "Cuida el Agua" , learning about Peru's water-based instruments and creating abstract paintings based on Peru's rain songs. Questions about our curriculum, methodology or program? Call 212-665-9460 or send us a message below and we'll get back to you within 1 business day!